1 A None No Power Seat 1 A is a standard Delta One Bulkhead seat, however the proximity to the lavatories and galley may be bothersome. 1 B None No Power Seat 1 B is a standard Delta One Bulkhead seat, however the proximity to the lavatories and galley may be bothersome. 1 C None No Power Seat 1 C is a standard Delta One Bulkhead seat, however the proximity to the lavatories and galley may be bothersome. 1 D None No Power Seat 1 D is a standard Delta One Bulkhead seat, however the proximity to the lavatories and galley may be bothersome. 16 C None No Power Seat 16 C is a standard Delta Comfort+ Bulkhead seat that may have restricted legroom due to the position of the bulkhead. There is no floor storage for this seat during take-off and landing. 16 D None No Power Seat 16 D is a standard Delta Comfort+ Bulkhead seat that may have restricted legroom due to the position of the bulkhead. There is no floor storage for this seat during take-off and landing. 16 E None No Power Seat 16 E is a standard Delta Comfort+ Bulkhead seat that may have restricted legroom due to the position of the bulkhead. There is no floor storage for this seat during take-off and landing. 17 A None No Power Seat 17 A is a standard Delta Comfort+ Bulkhead seat with extra legroom due to the position of the bulkhead in front. The tray table is in the armrest, making the armrest immovable and slightly reducing seat width. There is no floor storage for this seat during take-off and landing. 17 B None No Power Seat 17 B is a standard Delta Comfort+ Bulkhead seat with extra legroom due to the position of the bulkhead in front. The tray table is in the armrest, making the armrest immovable and slightly reducing seat width. There is no floor storage for this seat during take-off and landing. 17 F None No Power Seat 17 F is a standard Delta Comfort+ Bulkhead seat with extra legroom due to the position of the bulkhead in front. The tray table is in the armrest, making the armrest immovable and slightly reducing seat width. There is no floor storage for this seat during take-off and landing. 17 G None No Power Seat 17 G is a standard Delta Comfort+ Bulkhead seat with extra legroom due to the position of the bulkhead in front. The tray table is in the armrest, making the armrest immovable and slightly reducing seat width. There is no floor storage for this seat during take-off and landing. 19 A None No Power Seat 19 A is a standard Delta Comfort+ seat with limited recline due to the Exit Row behind. 19 B None No Power Seat 19 B is a standard Delta Comfort+ seat with limited recline due to the Exit Row behind. 19 F None No Power Seat 19 F is a standard Delta Comfort+ seat with limited recline due to the Exit Row behind. 19 G None No Power Seat 19 G is a standard Delta Comfort+ seat with limited recline due to the Exit Row behind. 21 A None No Power Seat 21 A is a standard Delta Comfort+ seat that has extra legroom due to the exit row in front. The proximity to the lavatory may be bothersome. The tray table is in the armrest, making the armrest immovable and slightly reducing seat width. 21 B None No Power Seat 21 B is a standard Delta Comfort+ seat that has extra legroom due to the exit row in front. The proximity to the lavatory may be bothersome. The tray table is in the armrest, making the armrest immovable and slightly reducing seat width. 21 F None No Power Seat 21 F is a standard Delta Comfort+ seat that has extra legroom due to the exit row in front. The proximity to the lavatory may be bothersome. The tray table is in the armrest, making the armrest immovable and slightly reducing seat width. 21 G None No Power Seat 21 G is a standard Delta Comfort+ seat that has extra legroom due to the exit row in front. The proximity to the lavatory may be bothersome. The tray table is in the armrest, making the armrest immovable and slightly reducing seat width. 22 C None No Power Seat 22 C is a standard Economy Class seat that may have restricted legroom due to the position of the bulkhead. The close proximity of the lavatory may be bothersome. The tray table is in the armrest, making the armrest immovable and slightly reducing seat width. There is no floor storage for this seat during take-off and landing. 22 D None No Power Seat 22 D is a standard Economy Class seat that may have restricted legroom due to the position of the bulkhead. The close proximity of the lavatory may be bothersome. The tray table is in the armrest, making the armrest immovable and slightly reducing seat width. There is no floor storage for this seat during take-off and landing. 22 E None No Power Seat 22 E is a standard Economy Class seat that may have restricted legroom due to the position of the bulkhead. The close proximity of the lavatory may be bothersome. The tray table is in the armrest, making the armrest immovable and slightly reducing seat width. There is no floor storage for this seat during take-off and landing. 41 A None No Power Seat 41 A is a standard Economy Class seat in the last row of the plane. The proximity to the lavatories may be bothersome. 41 B None No Power Seat 41 B is a standard Economy Class seat in the last row of the plane. The proximity to the lavatories may be bothersome. 41 C None No Power Seat 41 C is a standard Economy Class seat, however the close proximity to the lavatories may be bothersome. 41 E None No Power Seat 41 E is a standard Economy Class seat, however the close proximity to the lavatories may be bothersome. 41 F None No Power Seat 41 F is a standard Economy Class seat in the last row of the plane. The proximity to the lavatories may be bothersome. 41 G None No Power Seat 41 G is a standard Economy Class seat in the last row of the plane. The proximity to the lavatories may be bothersome. 42 C None No Power Seat 42 C is a standard Economy Class seat in the last row of the plane. The proximity to the lavatories and galley may be bothersome. 42 D None No Power Seat 42 D is a standard Economy Class seat in the last row of the plane. The proximity to the lavatories and galley may be bothersome. 42 E None No Power Seat 42 E is a standard Economy Class seat in the last row of the plane. The proximity to the lavatories and galley may be bothersome. 9 A None No Power Seat 9 A is a standard Delta One seat however, this seat is missing a window. 9 D None No Power Seat 9 D is a standard Delta One seat however, this seat is missing a window. Each Delta One seat, as well as rows 16-25 of the Economy Cabin, has power outlets available. This Boeing 767-300ER seats a total of 211 passengers. It has a cruising speed of 517 mph and a range of 6,408 miles. Delta and Seatguru both list this seat as having limited recline, but that is not the case. Comfort+ seats in row 19 have normal recline for this section. The row behind is so far behind that you can recline fully w/o worrying about the person behind you. If you fly business class and like a seat near the window, choose an odd numbered seat. These have about 2-3 inches more pitch than the even numbered seats. You can feel the difference if you are tall. Seat 17A is a typical narrower C+ seat with the tray in the armrest. At 6'2" I had plenty of legroom, and was able to sleep reasonably comfortably stretched out. The one awkward detail was the TV screen. It was not the usual flip up unit stored in the armrest, it was mounted on the bulkhead wall. The wall was far enough away for my legs to stretch, so reaching the screen with my hand was not so easy. The audio jack was in the end of the armrest. Sat here from Frankfurt->Atlanta. I was a bit nervous selecting this seat as I'm 6'5" so middle seats geneally make me cringe. Regardless, I opted to spend the $100 to give it a shot. Best decision I made the entire trip. I had far more leg room than my standard Economy aisle seat on the departure to Frankfurt. The recline was the best part, significantly more than Economy. All the above enabled me to sleep for about 7 hours of the 10 hour flight. Didn't seem to notice any perks as far as amenities or food, but the space was well worth the $100 if you're of above average stature. If you can score a Comfort + aisle seat, I would still take that but Comfort + middle beats Economy aisle all day. The seats are comfortable enough to sit, but very uncomfortable to sleep in. They do flatten out to make a falt bed, BUT the space for the legs and feet is horribly restrictive. Your feet are scrunched in and it is very difficult to turn as your knees will bump against the sides. I am only 5ft 8in tall, I shudder to think what a taller person will experience. 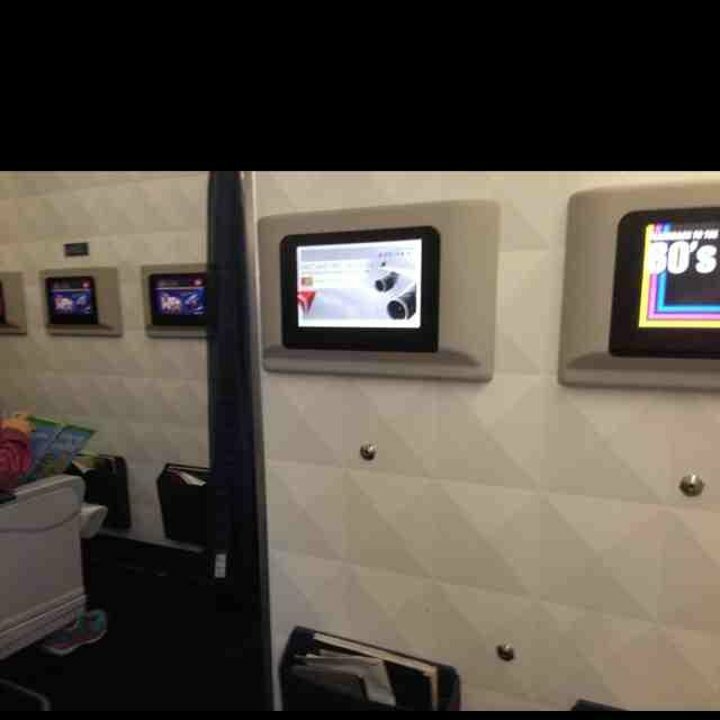 Delta made a grave error in getting these seats configured this way. I was on flight from Atlanta to LHR on 16 May and somehow this seat and 6A are now the seats without a window in Delta One cabin. Flight attendant said only the D version of 767 have windows on row 6. Fly ATL-MAD. If you want leg room, this is seat for you. However, there are several significant negatives. The tray is in the arm rest and does not move forward. It pins you in your seat and seems unusually small. You cannot reach the bulkhead mounted touchscreen TV when the tray is out. It easy to spill food and drink. The window is poorly aligned requiring you to turn your neck past 90 degrees. So I fly a route that uses this plane a lot, and have been in both economy and business (economy more so...). In a nutshell here is my thoughts on the economy options, hope this helps people: The exit row seats are very spacious (row 21 and 20), however, they are HARD compared to normal seats as they are thin to make them light. Also, row 20 (as well as 19) has limited recline which makes it recline similar to normal economy rather than eco +. I would only buy row 20 if you really need legroom or are getting it free, same goes for row 19. Row 22 is STAY AWAY, its standard economy but you have econ comfort to recline extra into you...terrible terrible seat on either of the sides. Plus the bulkhead there usually has a crying kid or two. Row 16 is acceptable if you have something to put your feet on. You can squeeze your feet on the sides of the bulkhead poking into business. But be prepared to be jealous of business as you are only a few feet from row 9 and get to smell all their food! Ha. In essence, I think row 21 is best if you need legroom, but the seats are hard and it gets cold. 17-18 are probably the best seats on the plane. Also, if you grab C or E in econ comfort the middle is almost always empyt (why pay for a middle seat). Hope this helps someone. Delta 1237 B767-300LR. Seat is an exit row seat and technically delta comfort, although the seat is very thin and uncomfortable compared to other standard Delta comfort seats. Extremely uncomfortable, actually painful! The cushioning on the exit row seats is very thin, after a while feels like sitting on a hard wooden board. The seat provides no support, when reclined I had to push my legs against the metal frame of the front seat to not slide off. Extra legroom is nice, but absolutely not worth paying the extra price. Much better seats in the comfort seats without exit. Never again. Had this on two flights with this airplane now. 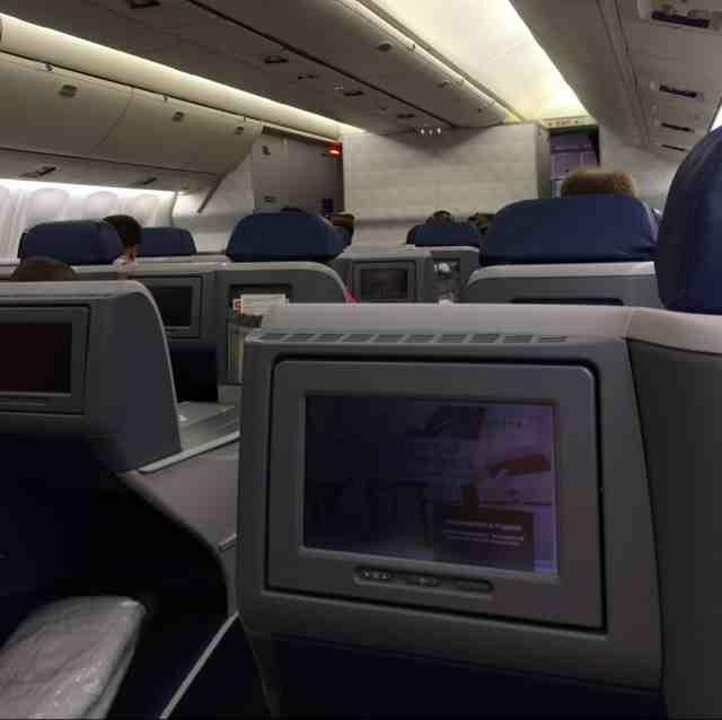 There is a huge difference between the Delta One seats on the Airbus 330 and the 767. The Airbus seats closely resemble first class on other high ranking carriers, but the 767 seats are quite narrow and much less comfortable on long distance flights. Service is great, but the meals were about c+. Gap between the bulkhead and seat is small, presenting challenges in egress and ingress. That small gap also leaves little room to pull up your knees if sleeping on your right side. 767-300ER ( V76L) 6D on a transcontinental between Atlanta and Seattle. For a "Delta One" ( First class ) seat it was a little snug. I am a big guy and understand that. The window is aligned with the seat. There are two pockets available for use and both are limited to what you can put in them. The seat layout alternates back and forth. 6D the seat is on the left with table space to the right. This is where all controls are also located as well as the tray table. Keep in mind that there is a gap between the seat and the wall of the aircraft. It is easy to drop things down between that you will never see again. The tray table extends out a good distance and even being a big guy I had plenty of room with the table out for meals. The IFES screen had good color was reasonable in size. There is a massage option for the seat but it is a bit primative and rough. If the person in front of you uses their massage option you can feel it in your feet and legs because they are tucked underneath their seat compartment. Flying transcontinel they provide you with the typical airline pillow and blanket which I think is different that international. Overhead space is large and I had no problems with my bags. I think this seat has normal comfort+ recline. Definitely more than a standard economy seat. The exit row seats (both row 20 and 21), have reduced seat cushions (not sure why). So while they are comfort + seats with additional leg room, the thinner cushion makes for a less comfortable ride. For seats 40 A and B the overhead baggage storage is reserved for crew and physically locked. You know, me and my seat-mate were pretty pleasantly surprised about the incline of this seat-not bad really! I would totally book this again. Why? B/c exit row people are behind you, they have to reach with effort to get to their screen (in your seat back) and I never felt the tappy tap tap. Plus no tuggy tug tug of people getting up and using your seat as their prop. To kicking of my seat either. Far enough, but still close to bathrooms. You CAN still reline, AND not feel bad about it. BONUS! Good seat and comfortable for a 10 hour flight in which I slept the entire time! I had 3D on the way out to Paris from Salt Lake City and prefer 1D due to better privacy. The proximity to the galley and lavatories was not "bothersome" at all. Seat comfort was good. I found that I was more comfortable sleeping with the seatback a bit raised from flat. Note that odd number seats have a better window view if that is important to you. Best seat ever. Here is why: Limited recline actually pretty good, and, you don't feel guilty about it since exit row guy is father back (and could barely reach his screen so I didn't feel the 'tappy tap' all night on my seat either!) Plus, no one is lining up for the bathroom by you like the poor exit row peeps (Rows 20&21) so no bathroom proximity issues, but close enough so that you don't have to travel far for your needs. Worth the upgrade for this one. This seat does show as limited recline but I found it to be comfortable. It reclined plenty for me. Flew ATL-STR on a Delta 767L. My seat, 18A, was spacious and comfortable - and I am a big person. I clearly would recommend it. Service on the flight was really good. This was a nice Economy Class. Free Movies on the seatback, The food was nice. Very comfy seat, a small amount of legroom but very manageable. I was able to sleep a little bit on this flight. 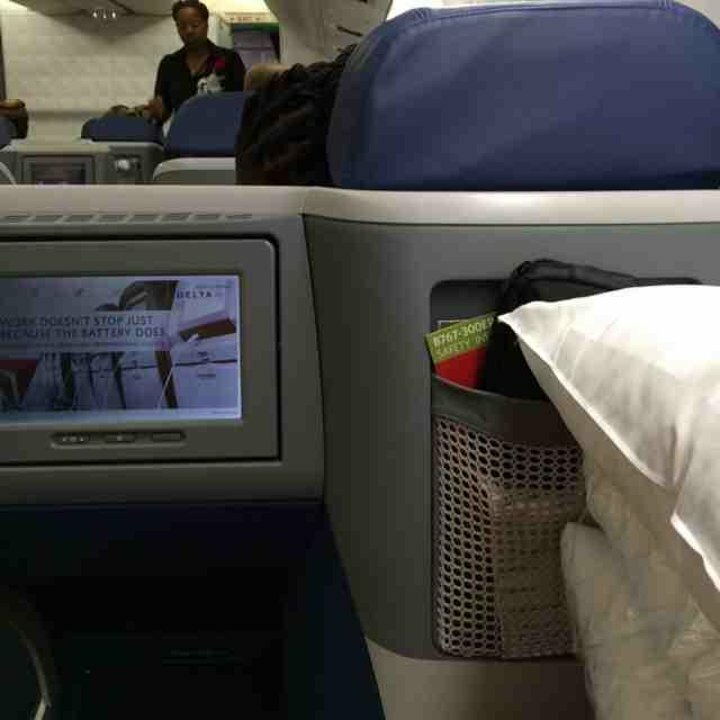 Experienced Business Class on 3 airlines (DL, AF, and VS (Virgin Atlantic)) during a recent trip to South Africa. Delta had the best overall experience. The seats were very comfortable. A little tight around the feet and not quite as wide was the AF A380 seats. 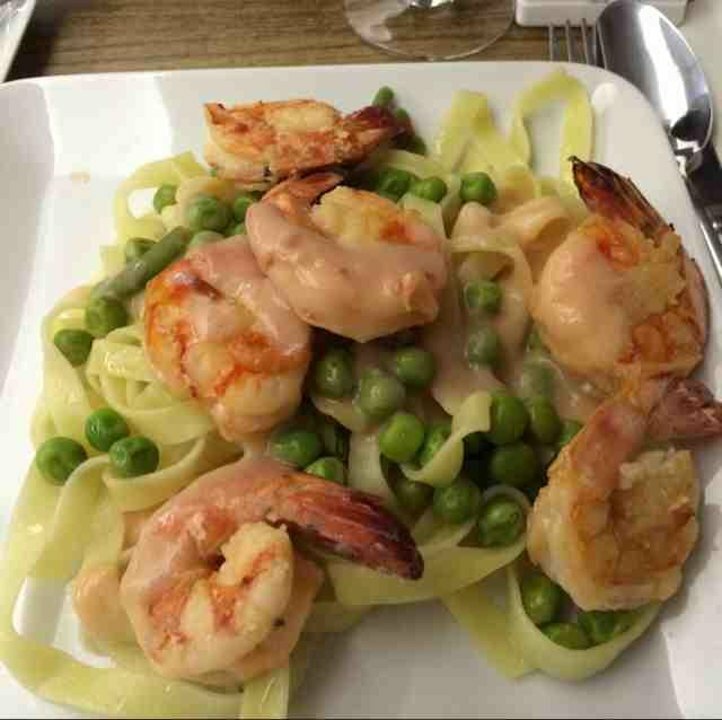 The cabin service was the best overall as far as food, frequency, and availability. We had to beg for refills on the AF flight. Very uncomfortable seat, narrow, tray table very small, very little seat padding and a reduced depth seat probable due to emergency exit.Very cold next to the exit, had three blankets over my legs and still cold. Good leg room but that was little compensation.To think I paid extra for this seat as an 'ecomomy comfort' seat!!! I would rather have stayed down back. Excellent biz class with nice blanket and pillow. I would avoid row 9 windows, if possible. 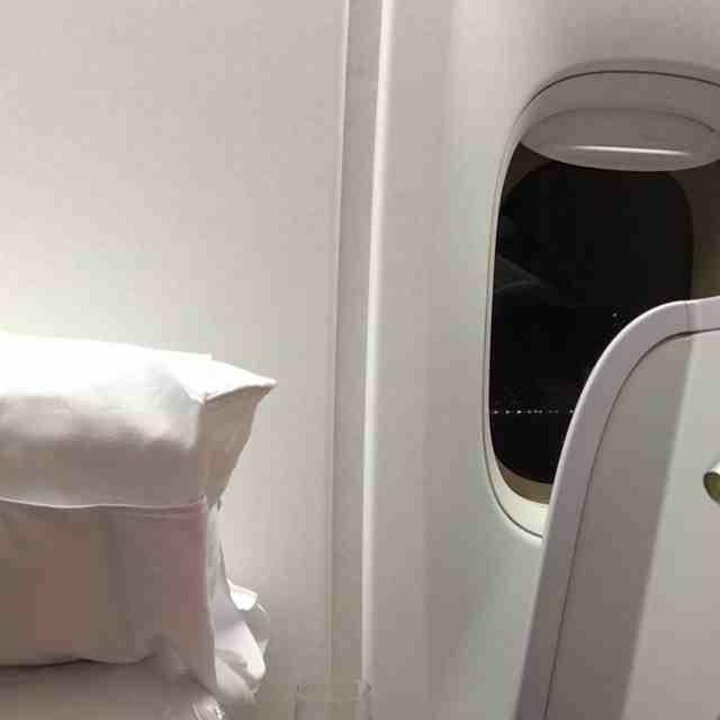 The first row of economy overlaps and the thin curtain did not block the light and noise. Excellent biz class - just choose a different seat. Less padding in the exit row seat which made it very uncomfortable. I had brought an extra pillow with me which made the seat tolerable. Very cold next to the exit door and the blanket you are given is so thin that it's nearly useless. Flight attendants were inattentive and pretty much ignored everyone. Food was terrible. Legroom was the only plus. Great seat. The bulkhead if far enough away to give you more room than Economy Comfort seats behind you. This flight was an overnight and the seats were NOT comfortable. The recline is trivial - and the lack of footrest or support for your legs is bad. The minimal extra legroom did nothing much for me, and the tray-table did not extend close enough to me - there was an 8.5" gap between the front edge and my body. This is essentially just economy class with some tweaking; there is no difference in service (plastic cutlery), although you are given wine or cocktails without charge. At least the access to the toilets is reasonably good, important given the demand for same after a long overnight flight. I would not book this again.